Our dogs all have their own ways of waiting for us to come home. Being a social, pack animal, they are unhappy when their family leaves them behind. Inevitably, they can’t wait for us return. One Reddit user showed just how much his dog, Luna, misses him when he posted this sweet photo of her comforting herself when she thought everyone had left the house. 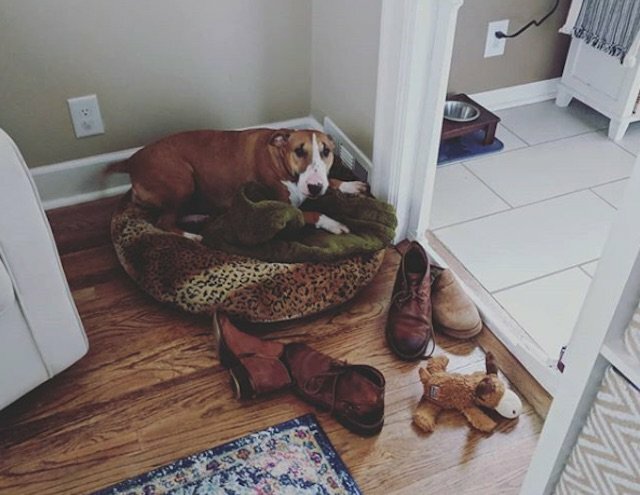 “When I leave the house my dog takes one of my shoes and lays with it (she never chews them) – well, this weekend my wife and kids were out of town and I went to Home Depot for 30 minutes and came home to this. I think she panicked and thought we all left. Broke my heart,” Justin Grosjean wrote on Reddit. n soon i was surrounded by my dad’s shoes on the floor…. n then i heard his FOOTSTEPS – that’s the sound i like the best! you see, i truly love this guy, much more than you’d believe…. It’s clear from that Luna is adored and well loved and only (very rarely) is left alone and has to collect daddy’s shoes.